In 10-inch skillet, cook sausage over medium-high heat 8 to 10 minutes, stirring occasionally, until no longer pink; drain; set aside. Cook broccoli as directed on package. Drain; set aside. Heat oven to 325°F. In large bowl, mix 1 beaten egg, flour and baking powder; beat well with spoon. Stir in ricotta cheese, Cheddar cheese, mushrooms, cooked sausage and broccoli. If using crescent rolls: Unroll dough; separate into 2 long rectangles. Place on ungreased large cookie sheet, with long sides overlapping 1/2 inch; firmly press perforations and edges to seal. Press or roll to form 14x10-inch rectangle. If using dough sheet: Unroll dough; cut into 2 long rectangles. Place on ungreased large cookie sheet, with long sides overlapping 1/2 inch. Press or roll to form 14x10-inch rectangle. Spoon sausage mixture in 3 1/2-inch-wide strip lengthwise down center of rectangle to within 1/4 inch of each end. Form sausage mixture into mounded shape. Make cuts 1 inch apart on longest sides of rectangle just to edge of filling. 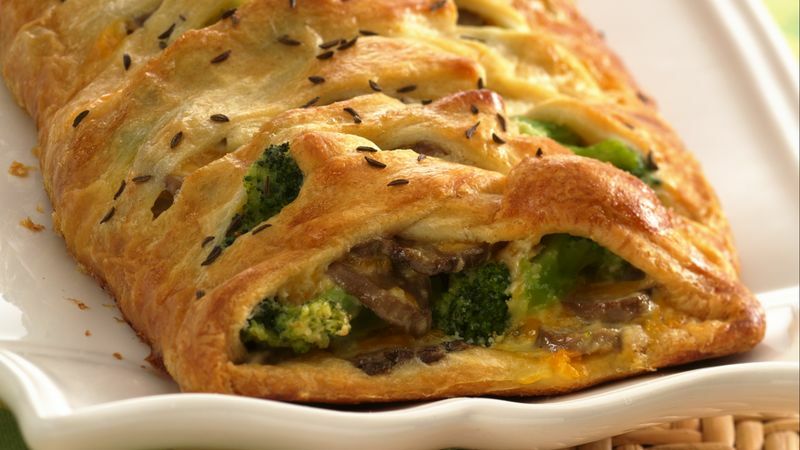 To give braided appearance, fold strips of dough at an angle halfway across filling with edges of strips slightly overlapping, alternating from side to side. Brush with beaten egg white; sprinkle with caraway seed. Bake 25 to 35 minutes or until deep golden brown. Cool 5 minutes; remove from cookie sheet. Cut into slices.